Downey Daily Photos: Rats...I hate rats! After the rain yesterday, I went outside to spend some time in the backyard. 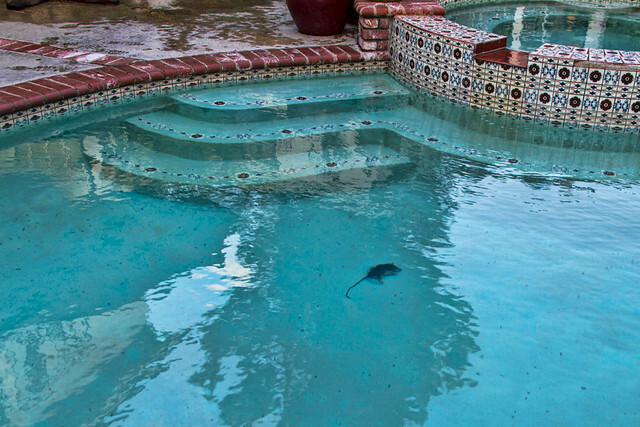 Much to my surprise, there was a "gift" for me in the pool...Yep, it was a dead rat. The problem was that I couldn't leave him there, it would be almost a week before the pool man would come. Of course, I couldn't reach him with the net without getting into the pool. It was cold and creepy at the same time. I'm not sure why he was in the pool...did he fall out of a pine tree, get chased there by our cat, was it related to the rain? Either way, last thing I wanted to do was wade into the pool to extract a dead rat. "The same rain that drowns the rat, will grow the hay."